Club CEO Winfried Engelbrecht-Bresges addresses the media after the Champions Day race meeting. Champions Day drew 48,242 race-goers on Sunday, 29 April and the buoyant crowd was treated to an afternoon of outstanding Group 1 action on the Sha Tin turf. The Hong Kong Jockey Club’s Chief Executive Officer, Mr. Winfried Engelbrecht-Bresges, said: “Today our three Champions Day features showed exactly what world-class Group 1 racing is all about. It was a great day of racing, it was quality racing and the success shows the strength and depth in the sport here in Hong Kong. I think that’s something we can build on to make this day and this meeting even more successful, and, going forward, I would like to see more international competition – that is something we can see happening. “There was some concern beforehand that there were not big field sizes for the three Group 1 races, but quality beats quantity,” he continued. Mr Engelbrecht-Bresges dwelt on the outstanding victory of Pakistan Star in the afternoon’s standout feature, the HK$24 million APQEII Cup. The Kerm Din-owned gelding was purchased out of the 2016 Hong Kong International Sale, having been sourced and prepared by the Jockey Club’s International Sale team. Champions Day turnover was the highest ever for QEII Cup day, up by 6.4% on the same day last year. 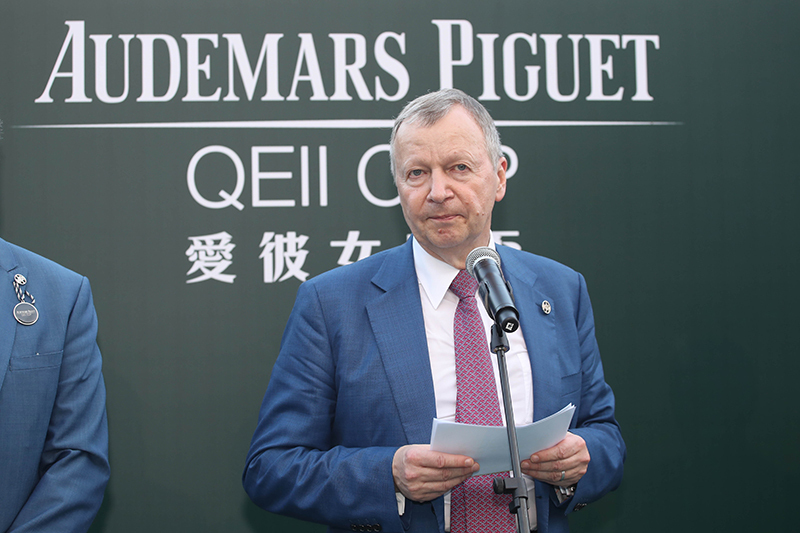 The CEO also paid tribute to the Club’s QEII Cup partner Audemars Piguet. “I would like to take this opportunity to thank Audemars Piguet for the 20-year partnership,” he said. “It was really the first commercial partner we brought in for our international races and together we have developed this race from Group 2 status to one of the top Group 1 races in the world. I think this is very satisfying.” He also thanked the two of the world’s heavyweight racing entities for their Champions Day support. “I extend the Jockey Club’s thanks to Godolphin and Sunday Racing for bringing top-class horses – Blue Point, Fine Needle, Al Ain and Danburite – to compete here today. We appreciate their patronage of one of our most important race days.